Being a Londoner I don't usually get to stay in a London hotel, so when I was invited to take a look at some of the rooms at the Ampersand Hotel in London, I was pretty chuffed. Like the rest of the hotel, all rooms have a theme that reflects everything Kensington Borough has to offer. For those of you not in the know: There a loads of museums in the area, such as the Science Museum, the Victoria and Albert Museum and the Natural History Museum. Also the Royal Albert Hall is a short stroll away from the Ampersand Hotel. All of these famous London landmarks are represented in the hotel's decor. The first room I was shown was a deluxe studio with a botany theme, meaning a lot of plants and flowers in the fabrics, wallpaper and art work and botany books on the book shelves. The room had a cosey feel with a modern yet homey design and colour scheme. The fluffy bedding was the kind you drown in promising restful nights. Besides the usual amenities like a TV, minibar en-suite shower room, there was an Ipod docking station and Nespresso machine.However, the best bit of the room was the bath tub in the sleeping area located right by the window. Complete with shower cap and plastic ducky. The second room was a suite with a geometry theme. With its geometric art works, warm colours and cosy sitting area the suite felt very intimate. There was a kitchenette with a minibar, microwave and Nespresso maker. This room also had an en-suite bathroom with a bath tub and a shower and, get this, a built in flat-screen TV. There was one thing I didn't like about the Ampersand Hotel though... I had to leave and go home. But if ever I need to book myself into a London Hotel, it will be here. 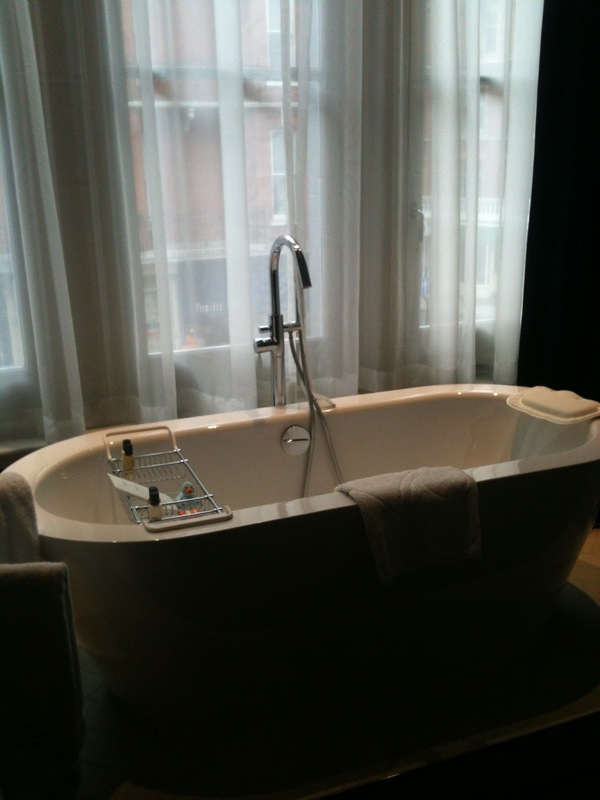 For more information and prices on staying at the Ampersand Hotel in London, click here. Or find more London hotels here.